And so it begins, the revenge match. This week had Shokugeki no Soma setup the bout for what I suspect its been long trying to get to since this third season started. The first cour undoubtedly had a feeling of being rather rushed, with the Moon Festival arc falling victim to a rather intense and fast adaptation. I assumed that the rush was all in service of getting to this particular point in the story. A point, which I found to be exceedingly exciting when I originally read it in the manga. Imagine my surprise then, when I found this week’s episode to be just as rushed as that Moon Festival arc I mentioned earlier. I’m going more off of memory than actual fact here, but I remember reading the manga and feeling like this whole setup phase of the competition between Soma and Hayama took a lot longer. I’m not sure if I’m just glamorizing this particular event itself, but I do remember things picking up a lot more once Hayama made it onto the scene. See, until now, we’ve mostly seen Erina and her character arc be the focus of this Azami Arc. Which, you know, makes sense because Erina’s big transformation is definitely one of the few bright spots in an otherwise rather dire situation. Shokugeki no Soma has always had antagonists, but none of them as utterly despicable as Azami. A big part of that is because the child abuse and twisted notions of dictatorship aren’t themes we’ve seen explored until now. Which, in turn, has certainly given Shokugeki no Soma a rather different vibe than what we’re used to. 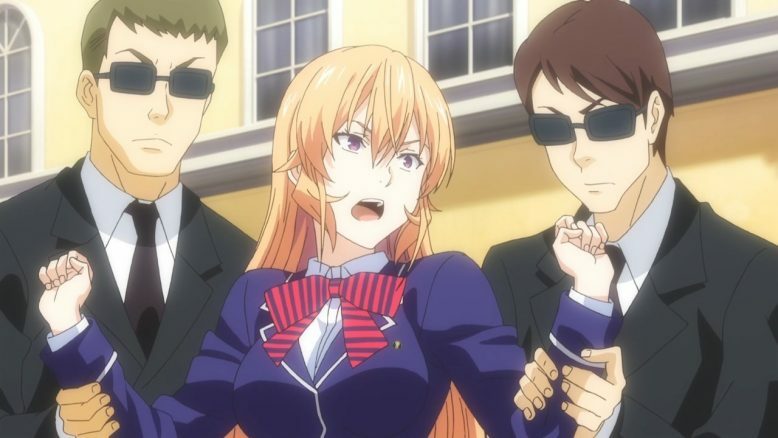 Going back to Erina and her improvement, the last few episodes have had a bit of a positive tone to them. Things seem to be getting better for Soma and co and its at this point that the story throws another dark curve ball towards the audience. Remember Hayama Akira? The dude that seemed like he had finally found friends in Soma and Ryo, well… He falls to the proverbial dark side and makes his reappearance here. That’s a huge twist, or at least it was for me when I first read it about a year ago. 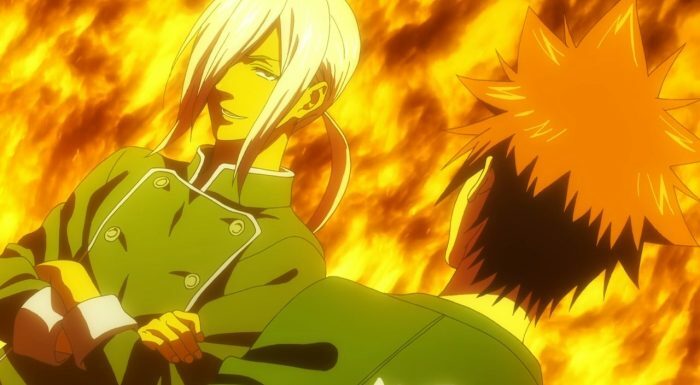 See of all the first years we’ve seen, Hayama was the one that seemed closest to “Shokugeki no Soma’s” big thematic answer of achieving cooking greatness. We saw that it was Hayama’s deep care and affection for his caretaker Shiomi that gave him the ultimate edge and put him at the very top. 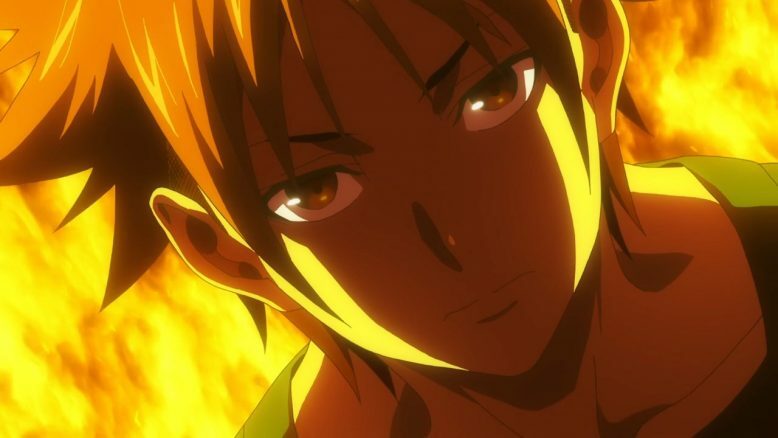 In some ways, you could say that Hayama represented the best of the current First Years at Totsuki, and to see him get corrupted and reappear as part of central is definitely a shocking moment, to be sure. Or at least, it should be. The problem, this week, and its a problem that we haven’t seen for a good while in this show, is that this whole setup thing happens too fast. We saw Hayama last week near the end, and then we see him and Soma exchange some heated words, before we jump into the advancement exam proper. There’s barely a moment to digest this rather earth shattering turn of events. Soma even comments in the episode itself, on how much he has to process, and I think it says something when even the story that’s being adapted is calling for some sort of pause here. The Hayama thing needs some time to breathe or at least, to settle in before we jump into the actual cooking battle between him and Soma. And look, I’m not saying that the show needs to drag out Hayama’s introduction or reveal everything surrounding his change of heart just yet. There’s a sort of sense of mystery that comes from Soma not being aware of what’s going on and having to face Hayama regardless. No, my problem is more with what immediately follows the Hayama reveal. Its in how quickly Soma’s whole “exploration of the latest ingredient challenge” goes. 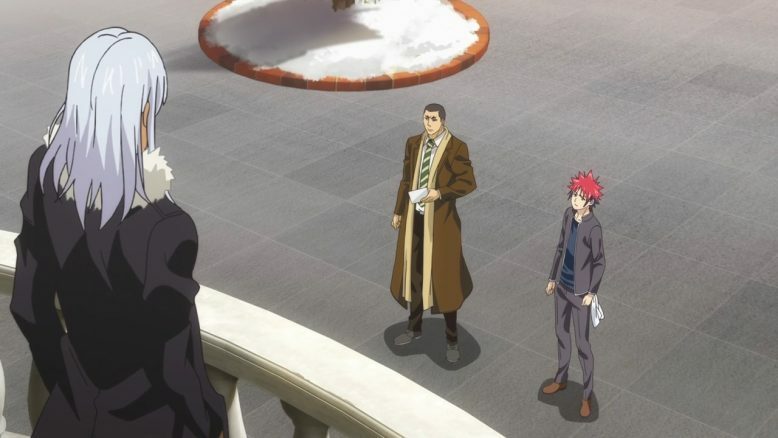 Stick with me for a second here… So… In keeping with the theme of ingredients (which seems to be the focus of the Hokkaido part of the story), the advancement exam that will have Soma taking on Hayama, is actually all about using Bear meat. Now… Personally, I’ve never had bear meat, and I don’t ever want to. No offense to the people who have had it and enjoyed it, but there’s something rather odd about eating a omnivore for me. And as the show itself spells out quite aptly, Bear meat is particularly smelly and hard to work with. So this is one situation where I’m actually not all that thrilled with theme selected here. 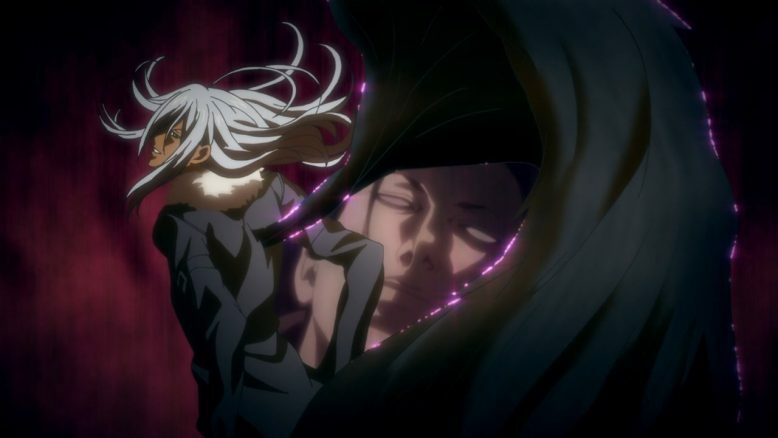 So I think it says something when I, in spite of the theme, find this Hayama vs Soma part of the advancement exam arc to be my favorite part of the Azami arc as of yet (I haven’t read or seen anything beyond this particular chapter). In the manga, I remember the whole segment of Soma struggling with the meat and trying to come to grips with it, reading a lot longer than what we saw here. 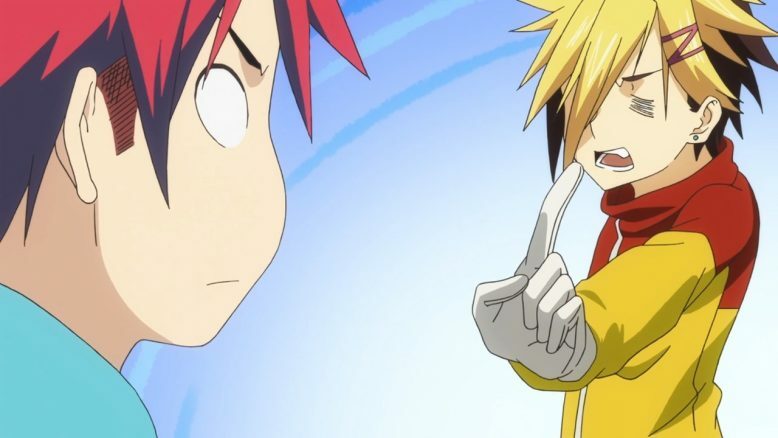 First Soma tries to do the work himself, fails quite miserably, and then Kuga shows up. You all remember Kuga right? The dude that I particularly liked as the antagonist in the Moon Festival Arc. He comes back here, and this time he’s all about actually helping Soma, both for his own gain and because of the less openly admitted reason of just taking a liking to Soma. 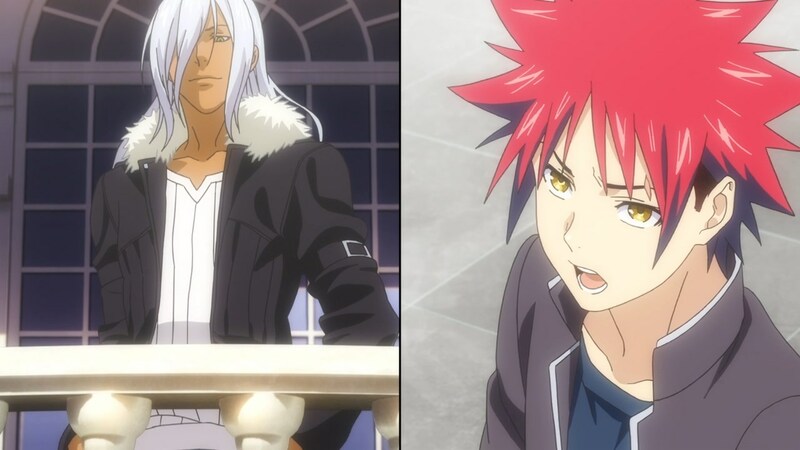 One of the highlights of this arc, even before the Hayama bout itself, is the interplay between Kuga and Soma. Soma is clearly at a disadvantage here, as nearly everyone has more or less spelled out. 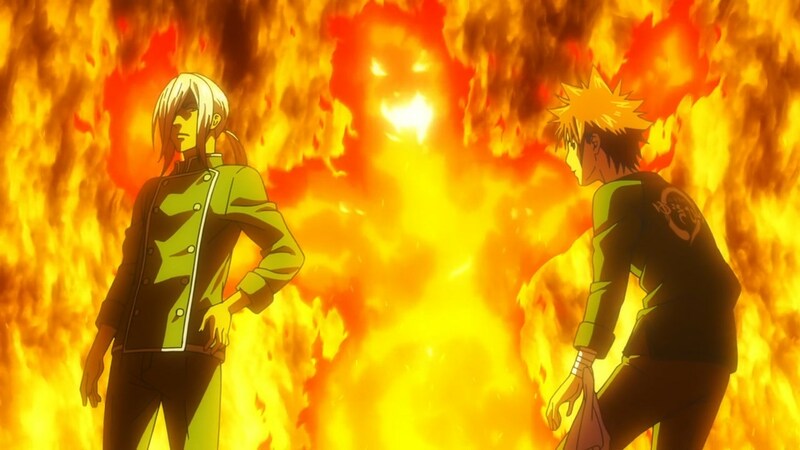 This is a situation where Hayama’s mastery of spices and smell is the key to victory. Its also a situation where Soma has very little experience in, especially since this is the first time he’s even ever handled Bear meat. 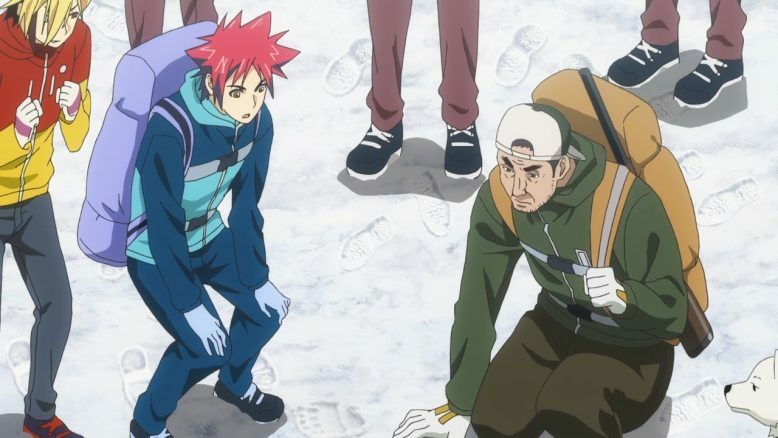 So its in this situation, where Soma struggles and Kuga tries his best to assist, that things really feel like they’re going south. Its a change in the winds, and there’s a real sense that this may be the third and final failure for Soma against Hayama. And just to really bring that sentiment home, Hayama himself appears at the end of the episode, showing off his particular dish and how he’s pretty much got it all in the bag. Problem is, that sense of dread never really materializes because we rush through Soma’s whole exploration thing and have him reach the answer for his smell problem in a matter of minutes. We go from Soma taking a step back and trying to understand Bears, to suddenly happening upon the answer and since it happens so quickly, it feels unearned. Again, this is one of those situations where pacing really makes a difference. Its also a bit of a head-scracher, because I really did believe that the show was rushing through everything else to get to this point in the story and really take its time. Now that we’re here, it seems like the show is just rushing through things because it just darn needs to. There’s not enough episodes or time to really adapt the manga at a pace that does the story justice. Which, is a darn shame, because if we go back and look at the very first season, then well… We’d see a stark difference in adaptation success. Don’t get me wrong, this episode works, and it certainly does hit on all the points it needs to. Its just that in really pushing through the content and without letting particular moments really breathe, the show ends up really lessening the impact of what should’ve been its highlight event for season 3. I’m curious to see where Shokugeki no Soma San no Sara is really going to end up at. By the looks of things, we’ll most probably end up concluding the Hayama/Soma bout come next week. Which, basically leaves us with a good 7 or so episodes to go. Things are what they are I suppose, and the trend of San no Sara really nailing the pacing was bound to come to a close sooner or later. I just wish we could’ve gotten through this particular point in the story before that happened.